So fan boys who were vigorously defending the 10 system universe as being all they really needed have to change their story yet again? "Hey guys! This is a case of things being lost in translation; Chris was asked a specific question about how many systems we expect to have online at the point that we've got most of the core mechanics completed and we would consider the gameplay experience suitable for a larger audience. There are no changes with regards to the planned amount of systems which are well documented on the current Star Map. "Also, it’s important to remember that the scope of the game has increased greatly since the original crowdfunding campaign. Since those early days we’ve created procedural planet tech, moved from 32 bit to 64 bit… all of it leading to billions of kilometers of space and millions of square kilometers of landmass to explore, all rendered in detail that matches the most detailed 1st person games that only have to worry about a few dozen kilometers of playable area. "This takes time to fill out, so while it will take us longer to fully deliver and populate every system at this fidelity rather than if we had only a handful of points of interest per star system, we have no intention of reducing the size of the Star Citizen universe." I take the statement as acknowledging that while the game won't have the promised 100 systems at launch, players should expect more than 10, with additional planets added sporadically as time goes by. I do, however, get the feeling Star Citizen will launch as more of a planetary first-person shooter set in a sci-fi setting with space flight rather than a space-based game like EVE or Elite Dangerous. The news from CIG did not interest me as much as the comments for the article posted on MassivelyOP. I wanted to see how the commenters would pivot from defending a Star Citizen universe with 5-10 systems to a promise of a larger one at launch. For some reason, many Star Citizen backers have a deep hatred and loathing of anything related to EVE Online. That sentiment came out from one commenter responding to the fact that EVE has over 8,000 systems. 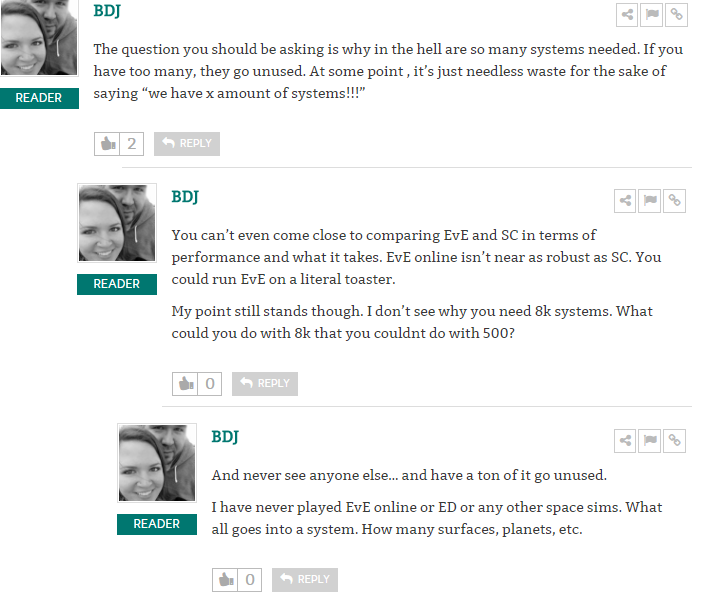 By the end, BDJ admits to having no experience playing space games. I have a feeling a lot of people attracted to Star Citizen want the planetary experience and the space part of the game is a side show. So let me address the issue, why so many systems? First, I want to address the big technical reason: server performance. EVE Online has over 5,200 normal space systems and 2,600 wormhole spaces to spread players over. The game even has 12 starter systems divided equally between 4 NPC empires. Except for major events involving thousands of players, the servers nowadays hold up fairly well. Now let's look at Star Citizen. A quick look at the funding page currently shows 1.8 million backers. By the time the game launches, that number should reach 2 million. I don't want to make the numbers too high, so assume that only 50% of those backers never log in and CIG sells no copies after launch. Of those 1 million active players, assume that between 1/6 and 1/10 are online at any one time. (I gathered those percentages from EVE back when CCP published subscriber numbers). Based on my rough math, expect Star Citizen to have between 100,000 and 167,000 players online at any one time. If Star Citizen only launches with 10 systems, that means an average of 10,000-16,700 players in each system. I'm not sure how stable CIG's netcode and servers will perform at launch, but even with top flight equipment, that's potentially a lot of activity for a node to handle. With 100 systems, the load becomes a much more manageable 1,000-1,700 players per system. With various sites of interest for players to visit dividing the load up within a system even further, 100 systems seems like players should have a good time. But only 10 systems? In that case, I expect CIG to either resort to a lot of instancing or, even worse, login queues. One complaint BDJ raises is sparsely populated regions of space. I guess in the terms of the current debate swirling around Star Citizen, an empty system as a placeholder is a bad thing. But differences in population density in a universe is a good feature, if a game developer can manage to do so well. In a sci-fi universe, people are not spread out uniformly. Instead, highly populated core worlds co-exist (sometimes violently) with sparsely populated fringe worlds. One of the charms of EVE is spending a month or two in a low pop area like low sec, null sec, or especially wormholes, and then jumping into high security space. Just looking at all the players in local chat makes it feel like you've jumped into a different world. Some players call high sec "scary" just because of that jarring transition. Another benefit of sparsely populated space is the ability to go out alone, explore, and find valuable content. Each system has the potential to spawn combat or exploration sites with, to use a technical term, phat loot. The more valuable sites are found in space where people are allowed to shoot at you. Finding a nice quiet spot with no one around is something people seek, not complain about. Well, unless the person complaining wants a fight, that is. Looking at a player organization level, the vast number of systems helps keep one or two groups of players from dominating the cluster, especially after the introduction of jump fatigue. Imagine if the 25,000 members of Goonswarm were to hop into a game with only 10 systems. Sorry Star Citizen players, but the Goons organizational abilities would probably lead them to dominating the entire game. In EVE, while they cause a lot of trouble, Goonswarm mainly stay in the regions of Delve and Querious preparing for the next big war. Even the Goons can't seize over 2,000 systems. At the end, BDJ asks what a system in a space game actually contains? In EVE, the systems contain many elements, all of which have some form of game play attached. For example, while players never enter the planetary atmosphere, they can play a mini-game and extract resources used in high end manufacturing and running player-built structures. The type of materials is based on the types of planets in the system. Some just take the materials to market to sell while other players build factory planets to produce high-end planetary items. Another important source of game play are moons. Moon mining is the source of key materials used in tech 2 production. In the winter expansion, CCP is turning moon mining from a passive to an active experience, requiring not only the construction of a refinery at a moon's Lagrange point (in the New Eden universe, each moon only has one Lagrange point). Not all moons are equal, however, and players will need to probe each moon to discover which ones hold desired minerals following the moon mineral reshuffle occurring in the winter expansion. Did I mention that EVE has tens of thousands of minable moons that need exploring? Also, the knowledge of which moons hold what materials is extremely valuable and won't make it to the wider internet for months, if ever. All-in-all, just the mere existence of moons in system brings some sort of game play. The third type of permanent object in space is the asteroid belt. Besides providing ore to mine, asteroid belts attract interesting NPCs. In low sec, some types of NPCs drop tags to improve security status and blueprints for the Mordu's Legion ships. In all areas of space, one is liable to find NPC mining operations, which can provide for some interesting fights, as the AI running the mining operations, including response fleets, is much better than the standard AI. In part of null sec, following parts of the NPC mining fleets leads to pirate shipyards where the blueprints for advanced ships drop. Currently, only Blood Raider space has such shipyards, but the Guristas are the next pirate faction to receive them, with the other factions to eventually receive shipyards of their own. Each system also has the chance to spawn temporary sites that, once run (or not run over a 3 day period), despawn. These sites run the range from mining to combat to data/relic sites that use the hacking mini-game. A system that looks insignificant most days could wind up providing a player lucky (or persistent) enough to find the site a huge payday. Or, if a player probes down a wormhole, the system can server as a temporary gateway to more interesting content. Finally, a big difference between EVE and Star Citizen is the ability of players to shape a system. I am not an expert on Star Citizen by any means, but I get the impression that the world Chris Roberts is building is set in stone, with massive structures like space stations only provided by CIG. In EVE, players can build their own space stations, called citadels, almost wherever they like. Players can also build transportation networks, called jump bridges, to facilitate travel. A system with no otherwise outstanding features could become a critical part of a jump bridge system, attracting player activity. Writing articles for the blog oftentimes serves to help me work out certain concepts. After writing over 1600 words, I still don't understand the concept of the "empty system". I guess, for the commenters defending Star Citizen from charges that CIG is shrinking the game, that a system is empty if it does not contain several areas of meaningful planetary interaction, which includes the ability of a player's avatar to walk on the planet. I thought that Star Citizen was a space game. Apparently I misunderstood, and Chris Roberts is designing a more traditional MMO in a science-fiction setting. I should think of Star Citizen more like Star Wars: The Old Republic (with much better space flight) and less like EVE or Elite Dangerous, where the game play is all space based. Because in a space-based game, as long as a system has a sun, planets, moons, and pirates, a system is never truly empty. I think I have a bit of experience when discussing massively multi-player online games. I started playing my first MMORPG in 2005 and began writing on The Nosy Gamer in 2009. Among the games I played at launch was Warhammer Online, a highly anticipated game that featured video blogs that helped raise the hype level to 11. A major sign that the game was in trouble, though, occurred before launch when Mythic had to scrap 4 of the 6 racial capital cities planned for launch. Despite the presence of the highly regarded Mark Jacobs, the lead designer of Dark Age of Camelot, the game only lasted five years. Fast forward 9 years and we have another highly hyped and anticipated game, Star Citizen, facing the same situation. In an interview with the German game site GameStar, (part 1 and part 2 translated on the r/starcitizen subreddit), Cloud Imperium Games founder Chris Roberts revealed that the game would only launch with 5-10 systems.